The 4TB entry-level version of WD's mirrored NAS is easy to set up and allows easy access to your home storage from all your devices. People want a place where they can store all their digital stuff, share it with people, and have easy access to it from all their devices. 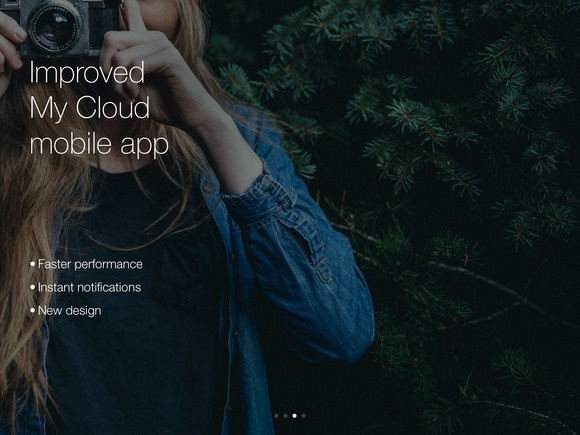 For many, that’s a service such as Dropbox, iDrive, or iCloud. But what if you don’t want all your stuff stored on someone else’s equipment? That’s where WD’s My Cloud Mirror (Gen 2), a dual-drive NAS box comes in. Fresh off the assembly line with a more capable processor and new, improved My Cloud 3 OS and mobile apps, it lets you easily share files around the household and across the web, as well as stream media to—and backup data from—your mobile devices. 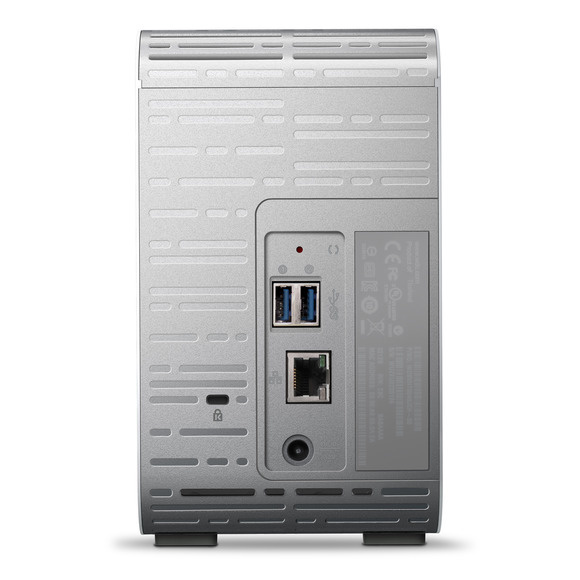 WD supports Windows, the Mac, iOS, Android, and even Windows Phone with an older app. Beyond that, the Mirror will stream media to any local device (smart TV, Wi-Fi speaker, Sonos system, and so on) that recognizes a DLNA or iTunes server, store PC backups, host a blog, and other cool stuff that online services rarely offer. The My Cloud Mirror’s configuration interface, which you access via a web browser, is clean and easy to navigate. Setting up your online account is also very easy, and something the box walks you through at the get-go. That is, if you bypass the setup document with its curt but correct instructions: Connect the ethernet cable, plug in the power cord, and browse to mycloud.com/setup. The Mirror doesn’t force you to create a password for the box (it does for your account). You should. The MyCloud Mirror interface is clean and easy to navigate. You could make use of the My Cloud Mirror without doing anything beyond downloading the WD My Cloud and Photo apps for your mobile devices. But if you want to get the most from the product, you’ll need to spend time perusing the inline help, learning a bit about connection protocols, as well as installing and configuring onboard extensions. So much for easy. The My Cloud Mirror ships with only the basic FTP, HTTP, and P2P remote-access apps installed, but it has other capabilities. Click the inconspicuous Add button at the bottom of the app list and you can install Acer’s abFiles (file sharing), aMule (P2P file sharing), Dropbox, IceCast (media serving), Joomla (content management/online publishing), phpBB (Bulletin Board), phpMyAdmin (MySQL management), Plex Media Server, SqueezeCenter (more media serving via Logitech’s MySqueezeBox), Transmission (torrents), and WordPress (Blogging). Setup info page for WD’s iOS app. Not all the WD My Cloud apps are available for the Mirror. One absence of note is Milestone video surveillance, which is reserved for WD’s My Cloud DL boxes. And though the press presentation touted it, there didn’t seem to be a TV-recording app available. While the My Cloud series can’t match the breadth of apps and functionality offered by the Synology’s and QNAP’s of the world, with the recently released 3.0 SDK, it seems that WD at least now seems to be interested in closing the gap. And please note that backup is one area where WD actually leads the pack. WD Sync continuous backup keeps designated folders (up to five versions of any file) on your PCs backed up, and the mobile apps will automatically sync photos back to the My Cloud Mirror. 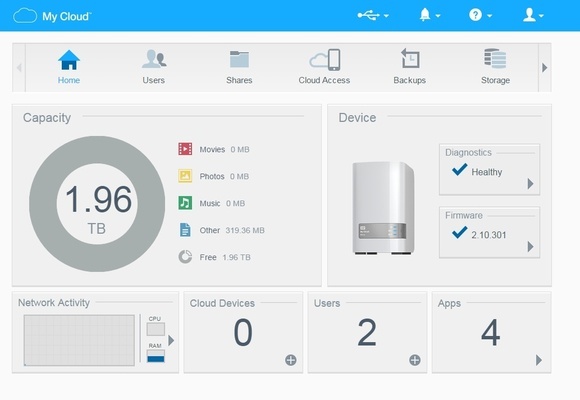 Three licenses for WD’s SmartWare Pro backup program comes with the My Cloud Mirror. There’s also WD Sync and apps for every major compute or mobile device platform. There’s also support for Apple’s Time Machine and three licenses for the company’s SmartWare Pro, which takes a more traditional scheduled backup approach. My only complaint about Smartware Pro, which features handy automatic file selection and supports Dropbox as a destination, is that it seems to allow only one drive or partition per backup job. I have quite a few partitions on my system with data divvied up among them. It would be nice to be able to back them all up in one job. The My Cloud Mirror offers basic connectivity via a single gigabit ethernet port and two USB 3.0 ports for storage. The CPU is a 1.3GHz Marvel ARMADA 385 dual-core (the first-gen My Cloud mirror came with a single-core processor), there’s 512MB of DDR3 memory, and our 4TB version shipped with two 2TB WD RED NAS drives striped in RAID 0 for speed. RAID 1 mirroring is available if you prefer data redundancy (two copies, one on each drive) and fault tolerance (you can still access your data if one of two drives fails). Unless you really have a lot of stuff (in which case you should consider the 6- or even 8TB models), I recommend using RAID 1 to keep it all safe. That hardware is good enough to make the HTML configuration interface responsive, transfer large files at about 90MBps, and smaller files and folders at about 60MBps. That’s as good as anything in its class. Streaming performance, even for Ultra HD video (resolution of 3840x2160 pixels), was fine—at least via the DLNA server played by Windows Media Player with the LAVA filters and PowerDVD 15. There’s no easy way to play content via a web browser, but streaming to the iOS My Cloud app was fine. The back of the My Cloud Mirror is home to a single gigabit ethernet port and two USB 3.0 ports for attaching storage. It does not support USB Wi-Fi unfortunately. The Mirror automatically powers up when you plug it in, and, as the assumption is that you’ll be leaving the box on 24/7 (it needs to be on for you to access the files) there’s no power button. That makes it less accident prone, and you can still turn the unit off using the admin menu in the web configuration interface. You can also schedule its active/sleep hours using the settings page. The My Cloud Mirror itself carries a 2-year warranty, and the WD Red NAS drives inside are good for a year beyond that. At retail from WD’s online store, the 4TB My Cloud Mirror costs $310, the 6TB version is $370, and the 8TB is $410. That’s not significantly cheaper than than a similarly populated QNAP HS-210 or a Synology DS-214se with their broader capabilities. However, I found the My Cloud Mirror online for $260, $320, and $360 respectively. That’s a bargain.